The 12 finalists in this year's Pop Idol TV contest are to release John Lennon's Happy Xmas (War Is Over) as a Christmas single. The song, which will reach shops on 15 December, is the favourite to take the Christmas number one spot. 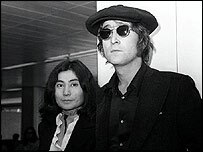 The song was twice a top UK hit for Lennon, Yoko Ono and the Plastic Ono Band with the Harlem Community Choir. It reached number four in December 1972, and number two at Christmas 1980 after Lennon was shot dead. The Darkness are second favourites for this year's Christmas number one crown, with their track (Christmas Time) Don't Let the Bells End. Sir Cliff Richard, Blue and comedian Avid Merrion are also expected to release festive songs. Ladbrokes spokesman Warren Lush said: "We have had no choice but to make the Pop Idol Christmas single red hot favourite to top the tree. "The announcement has seriously dented the chances of previous favourites The Darkness, Blue and Cliff Richard." Gennaro Castaldo of music retailer HMV said: "This could be one of the tightest races for the Christmas number one in recent years." The Pop Idol finalists are also releasing an album on 8 December. The festive race for the 2002 number one spot was a hard fought one between Pop Stars: The Rivals groups Girls Aloud and One True Voice. While Girls Aloud eased into the number one spot, also winning the reality TV talent show title, boy band One True Voice reached number two and split up after eight months together.